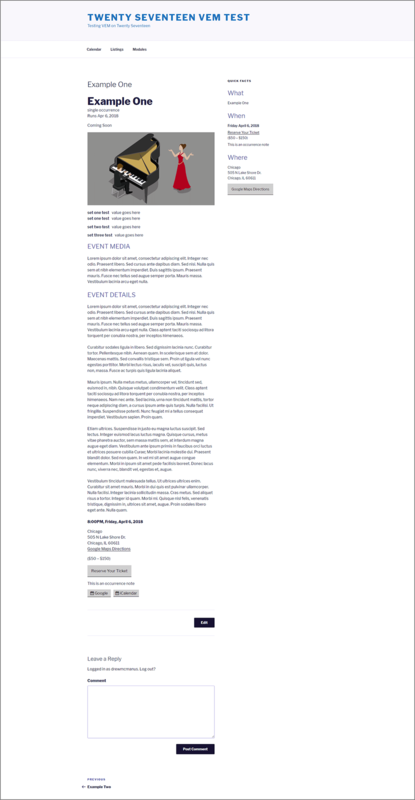 Out of the box, Venture Event Manager integrates seamlessly with WordPress. 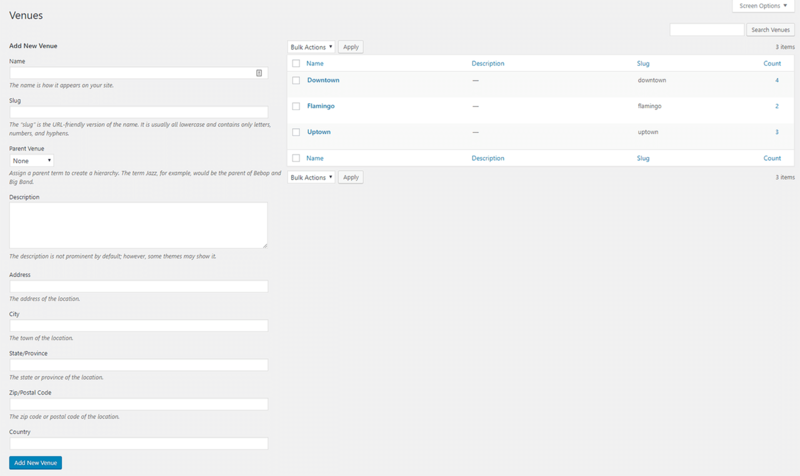 Frontend styling and UX is “touch me” beautiful while admin and settings panels are intuitive and fast. Keep in mind, we’re constantly enhancing functionality so the screenshots below may not be the most recent, but feel free to reach out with any questions. 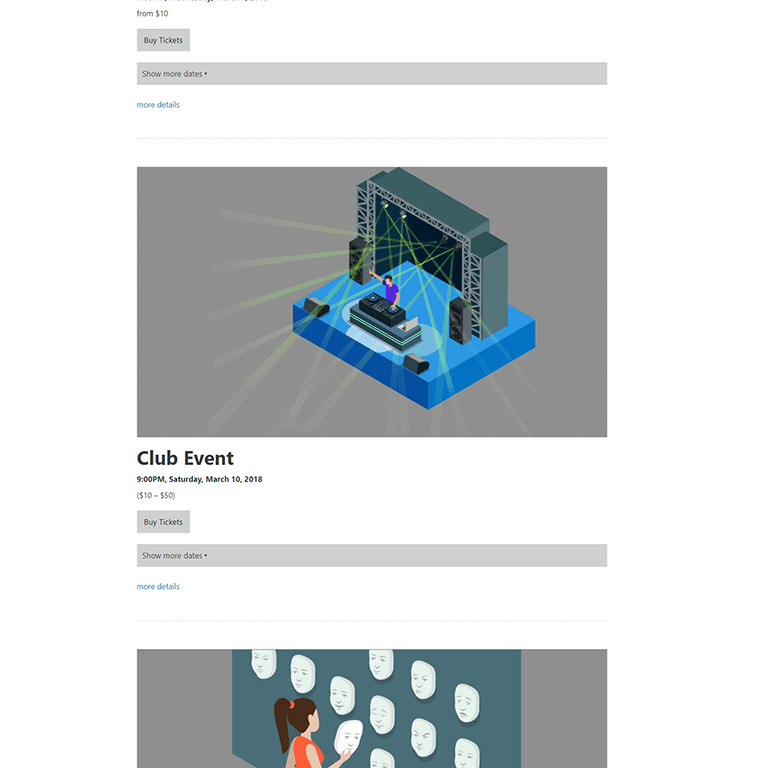 Dedicated admin panels make every aspect of creating events and displaying them your visitors a snap. 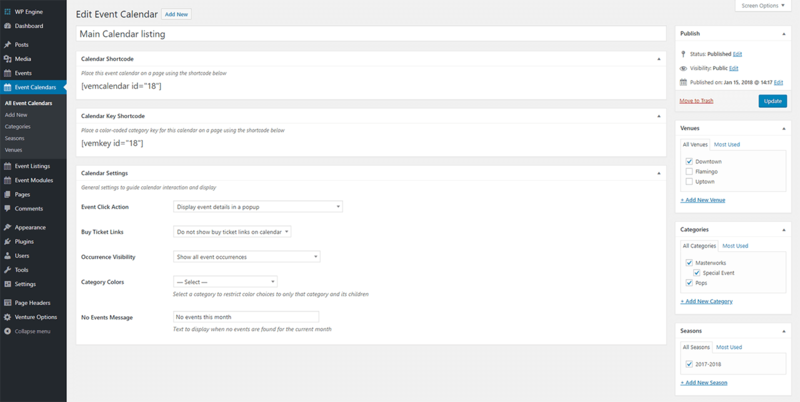 The options panels serve as your primary dashboard for managing all settings related to default layouts and displays along with date/time formatting and currency symbols. 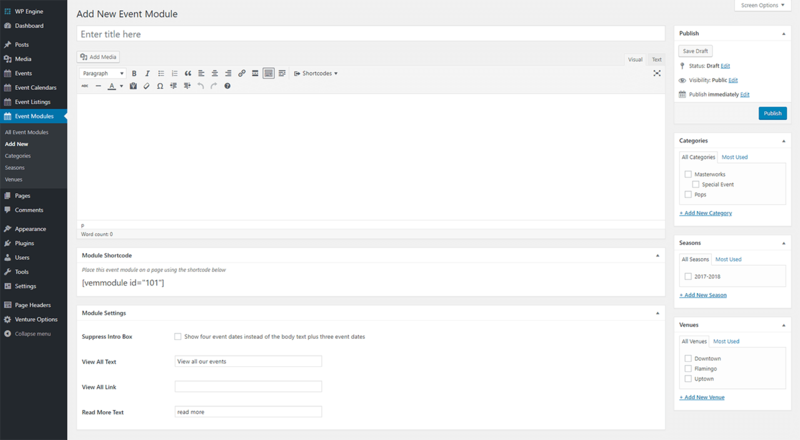 Oh, did we mention the drag and drop layout controls? That’s right, page layouts are are point and click simple. 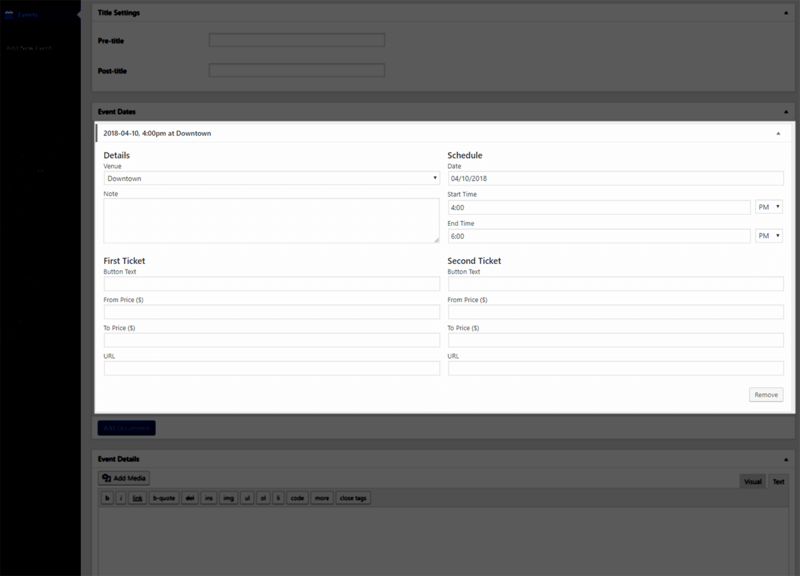 Managing every aspect of an event is accomplished through a single admin panel. It’s a marvel of simplicity and user friendly design. 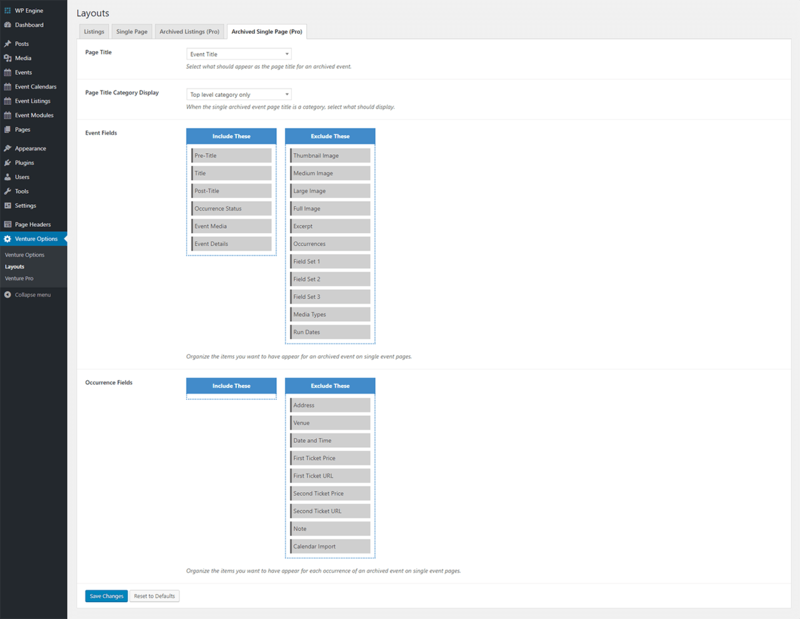 In addition to adding and editing existing events, you will manage your taxonomies (event categories, tags, seasons, and venues), which Venture uses to help you filter events inside calendar and event lists. Making an edit to an event’s information will push the respective change to the single event post along with each calendar, list, module, or widget that includes the event. It’s all about automation and saving you time! What makes VEM unique is how it handles an event with multiple dates. 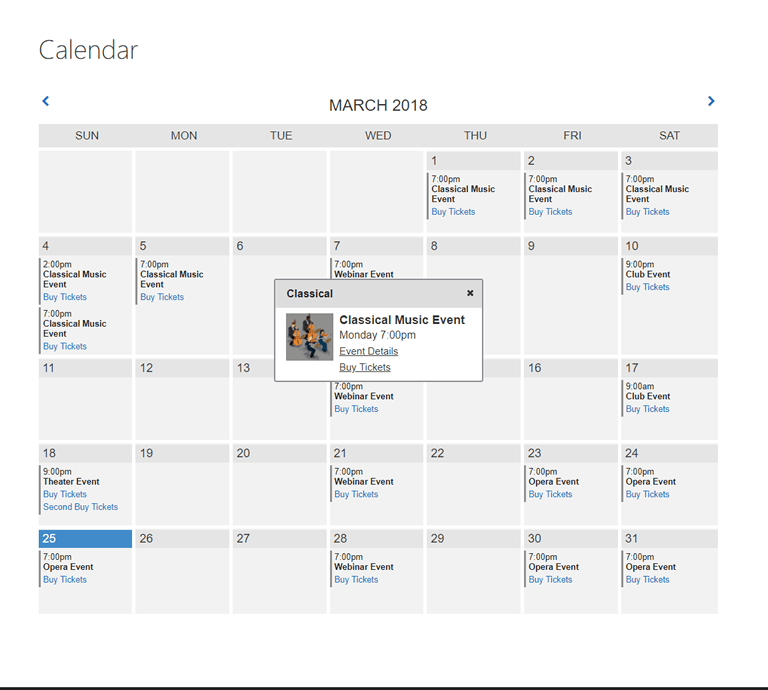 In addition to tradition recurring dates, you can create any number of occurrences, each with unique date, start/end times, venue, free-form note, and ticketing values. Selecting the “Add Occurrence” button copies all of the values from the most recently entered occurrence, saving you time when handling data input. With the Event Dates metabox expanded, you can see each of the unique values you can adjust for each occurrence. Your taxonomies are what VEM uses to help you filter events in or out of calendars, lists, upcoming event modules, and widgets. 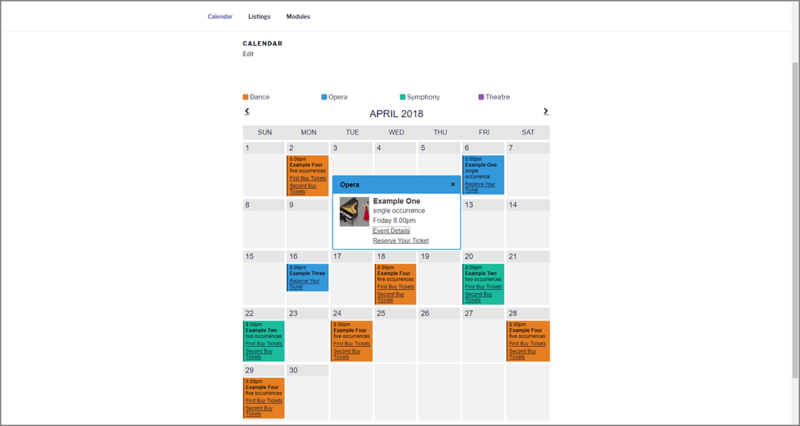 Categories provide parent/child control along with a color picker, which the system uses to determine the color of full page calendar icons associated with each event using that category. Venures also provide parent/child control and the system geolocates for Google Directions links based on the supplied address. 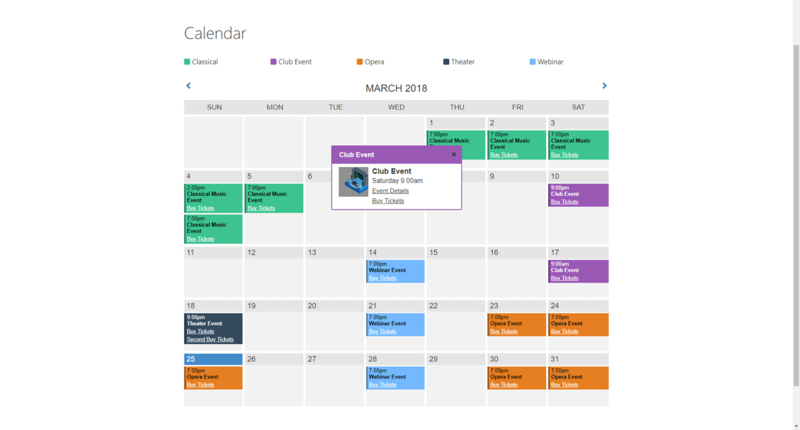 Seasons help you keep events grouped into date based categorization. 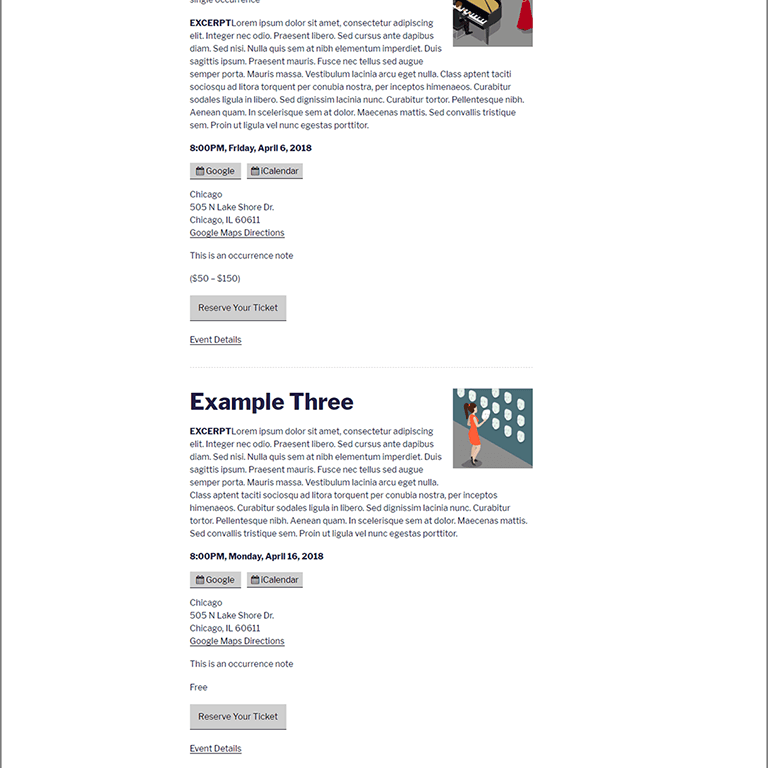 Tags work the same way you’re used to inside WordPress. 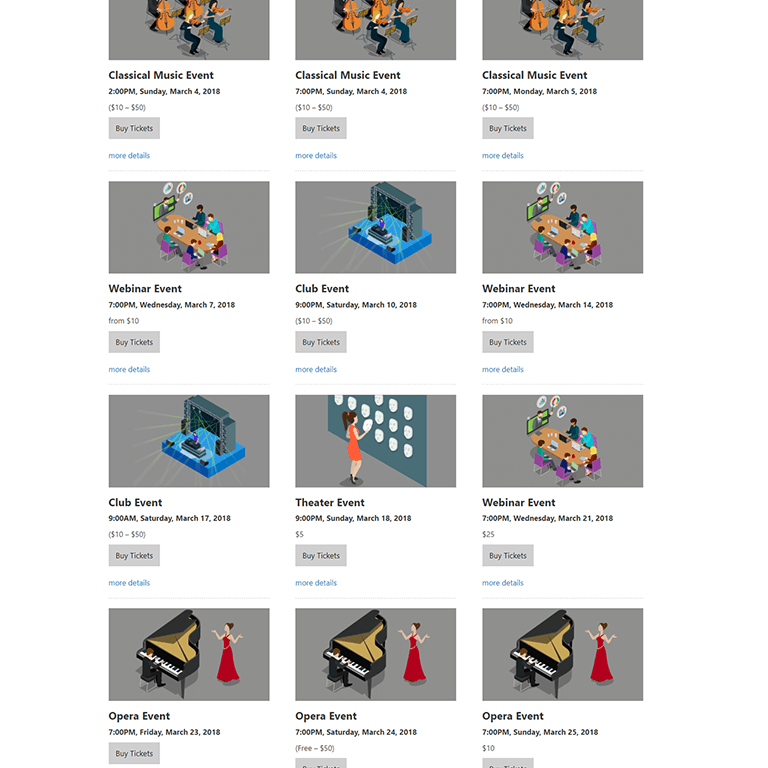 Unlike categories, seasons, and venues, they are an optional taxonomy to assign per event. 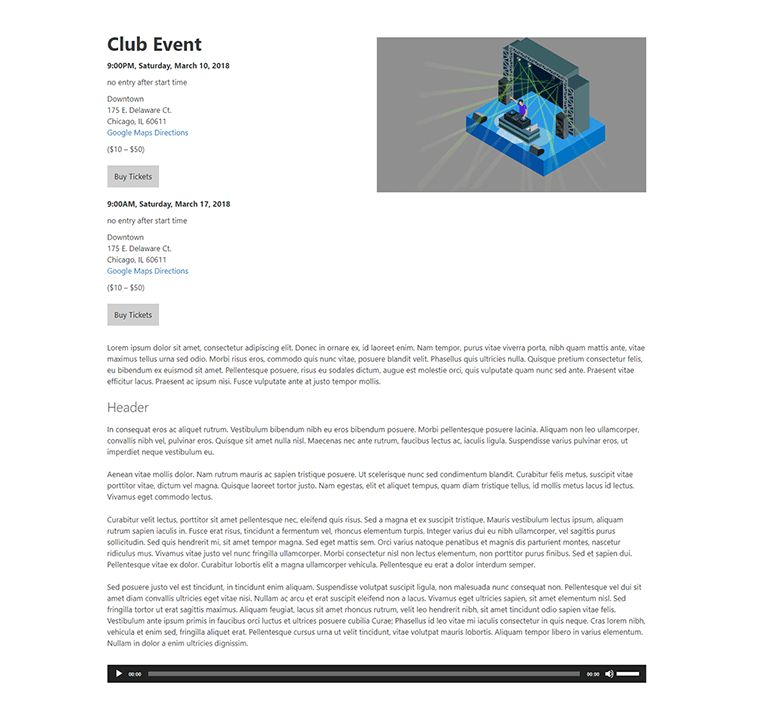 Media Types (Pro Feature) is a great to create categorize media based event archives, especially if you add audio or video after the event date. 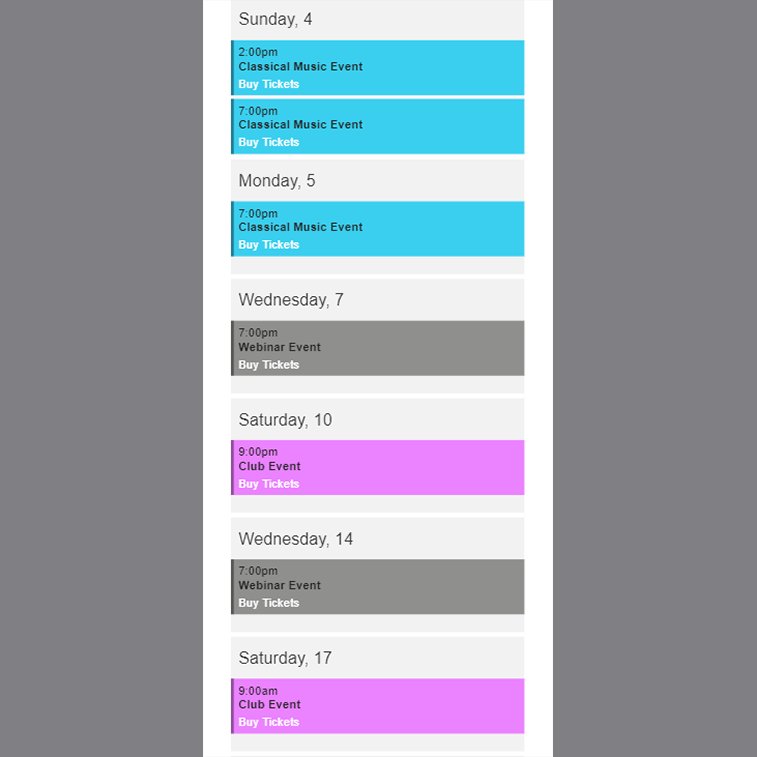 As functional as they are beautiful, Venture’s event calendars are infinitely extensible. 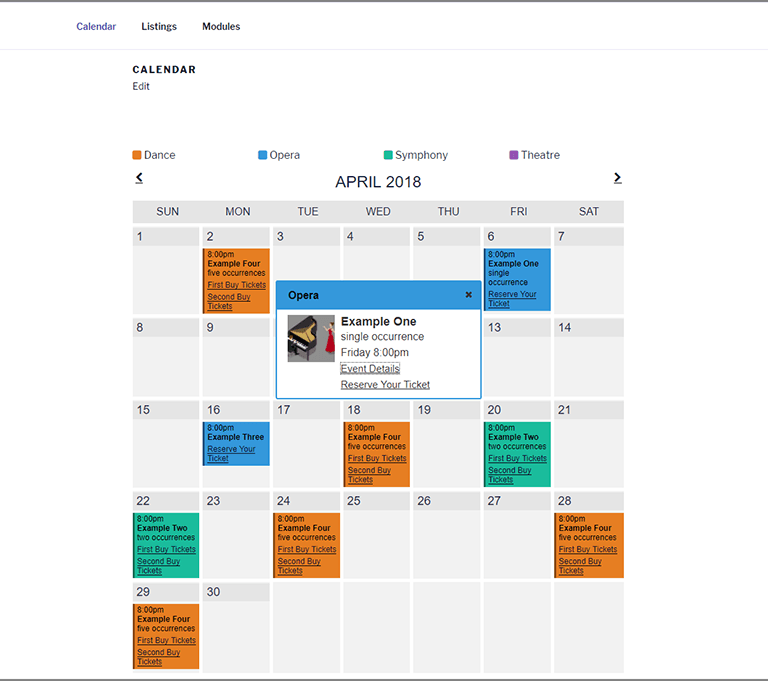 Include as many calendars as you like on the same page or combine them in page+widgets without worrying about conflicts. Shortcodes associated with the unique calendar and category key are generated automatically and unique to each calendar. You’ll copy and paste these into a page, post, or widget and the system will do the rest. By making the calendar and key shortcodes mutually exclusive, you can easily place the key above or below the calendar or even insert it into a shortcode column. Make a change down the road to that calendar’s settings and the system will push those through in real time without you ever needing to modify the shortcodes! Calendar Admin Panel automatically generates shortcodes for both calendar and key. All of your calendars are saved as individual post types so you can go back and edit anytime. You will also find the calendar and key shortcodes right from this dashboard. 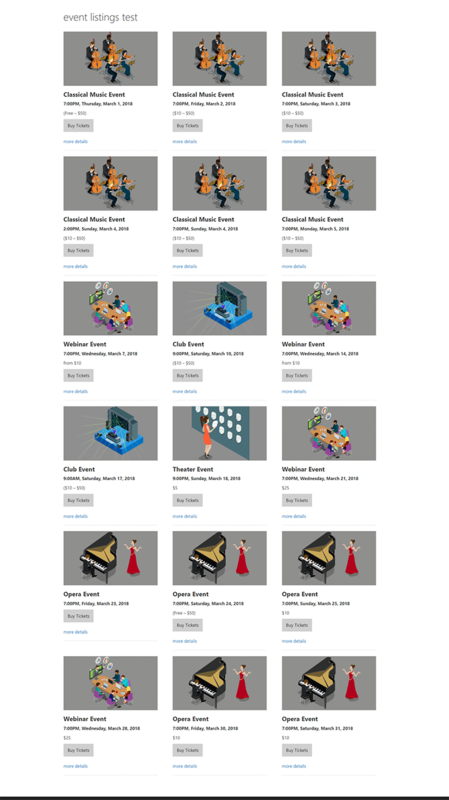 The go-to event display, lists display events and occurrences with order allowing users to quickly see upcoming events. Placed throughout the site via shortcode (including widgets! 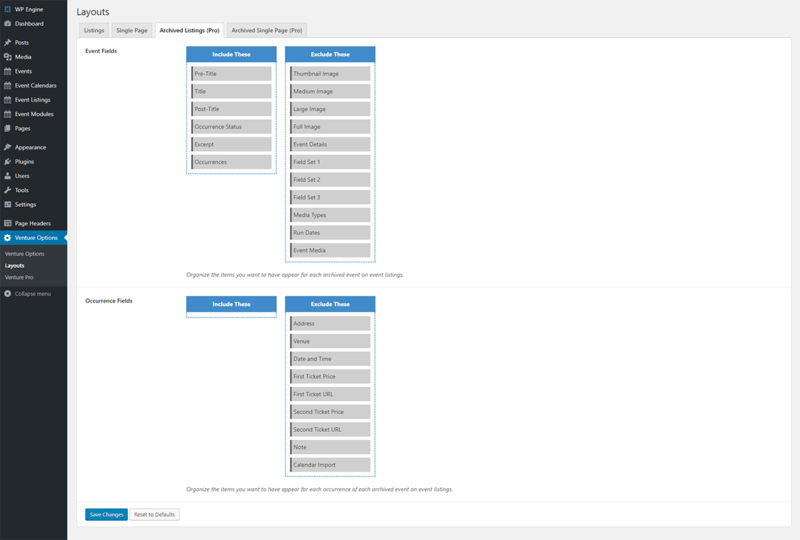 ), lists have hundreds of display options. 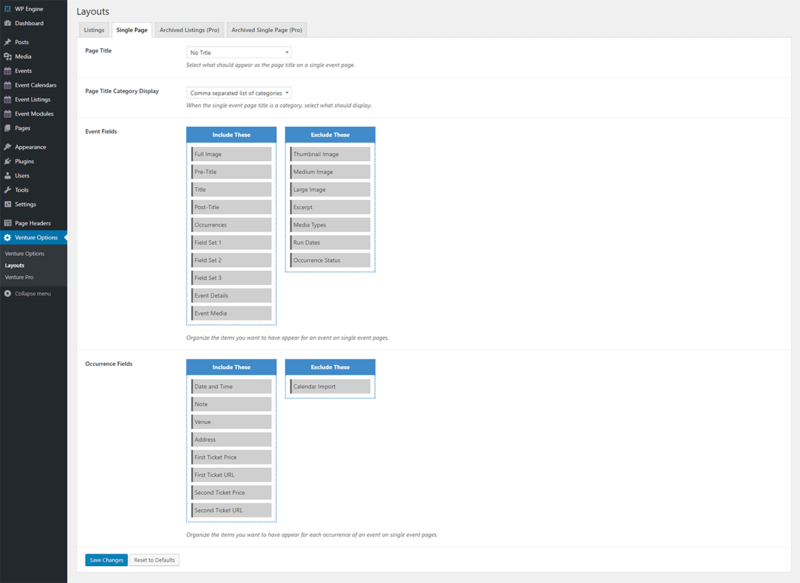 Listing options are among the most powerful you’ll find for any WordPress event management plugin. 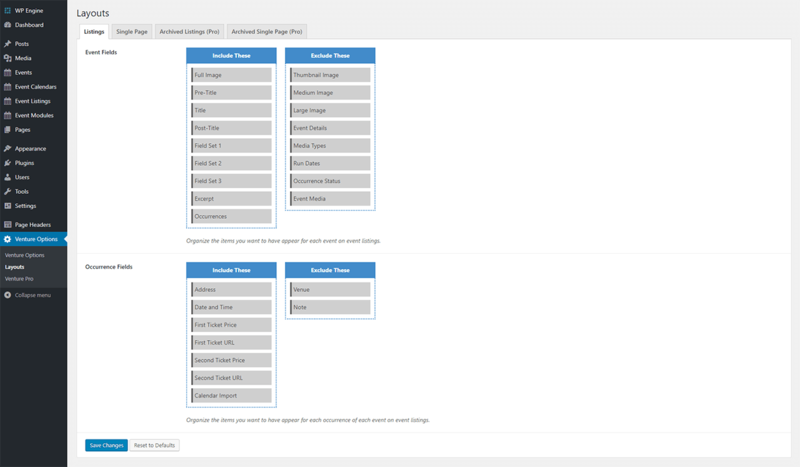 Pro users enjoy the ability to create custom display layouts as well as adding a powerful frontend filter display tool. The custom layout option is a must-have if you plan on using lists inside widgets or need to display lists with very different information. 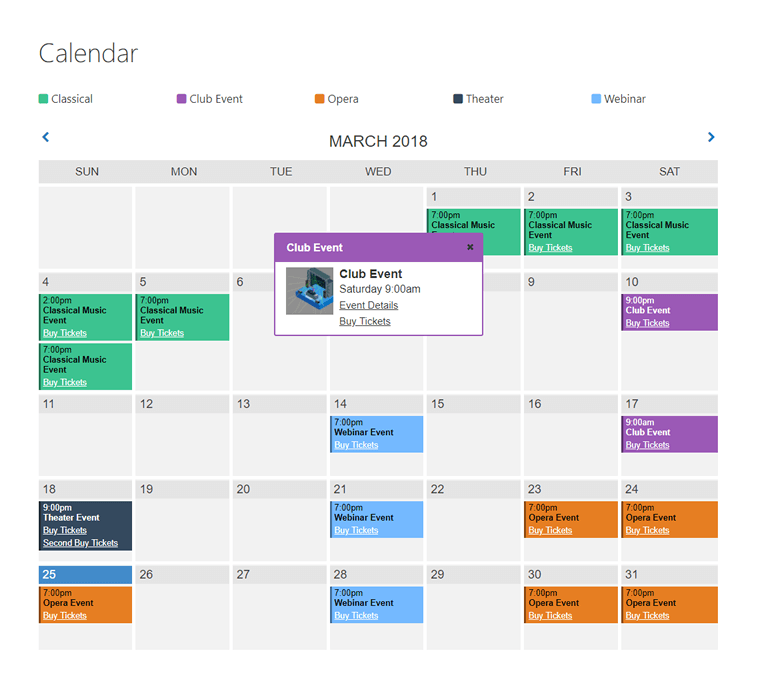 If your events have multiple occurrences, you can opt to group them together under a single event entry or break each one up into its own unique instance. 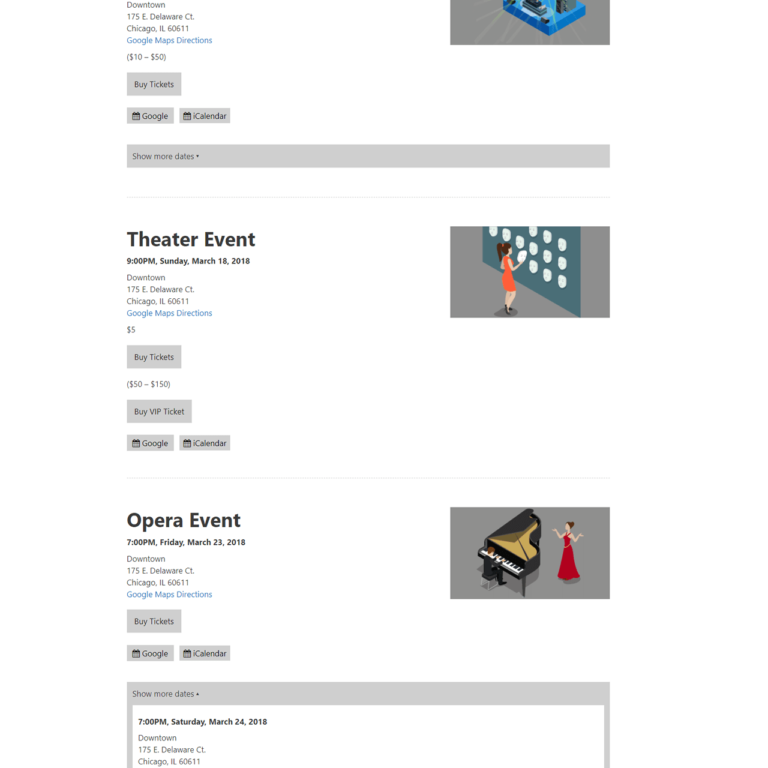 It’s a super cool and super smart way to display event info. Each listing generates two shortcodes: one for the actual list and once for the related search shortcode. The really cool part about the latter is the search function will automatically be limited to the same filtered display settings for that list! 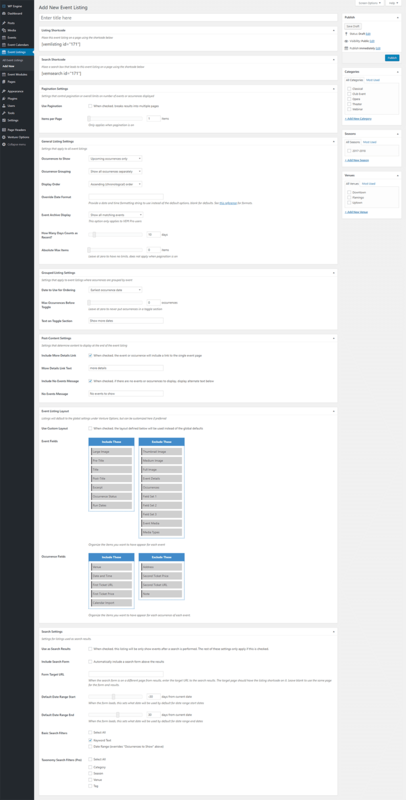 Event List Admin Panel (includes both Free and Pro Features). 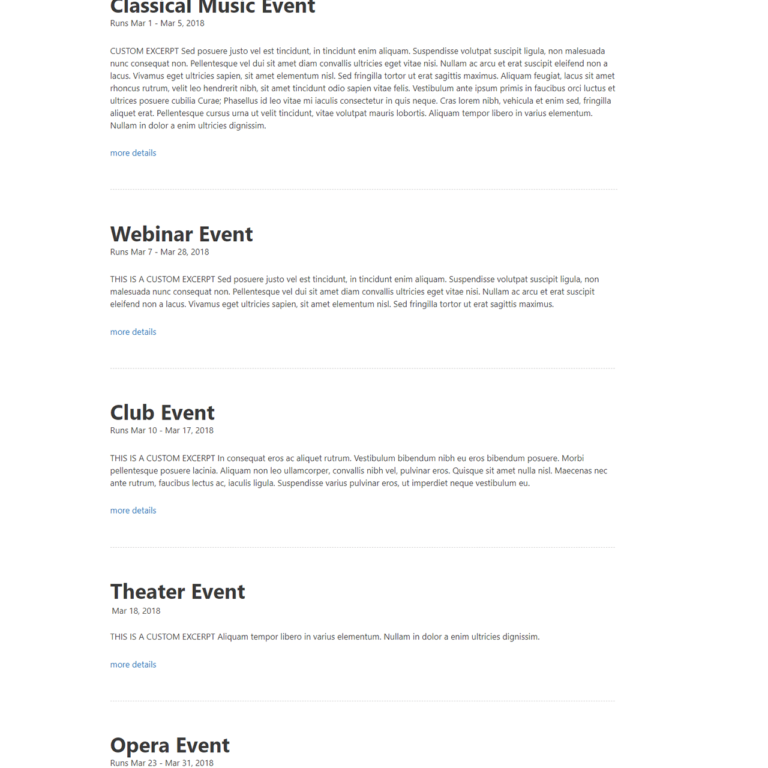 Event Lists overview display both list and search shortcodes. 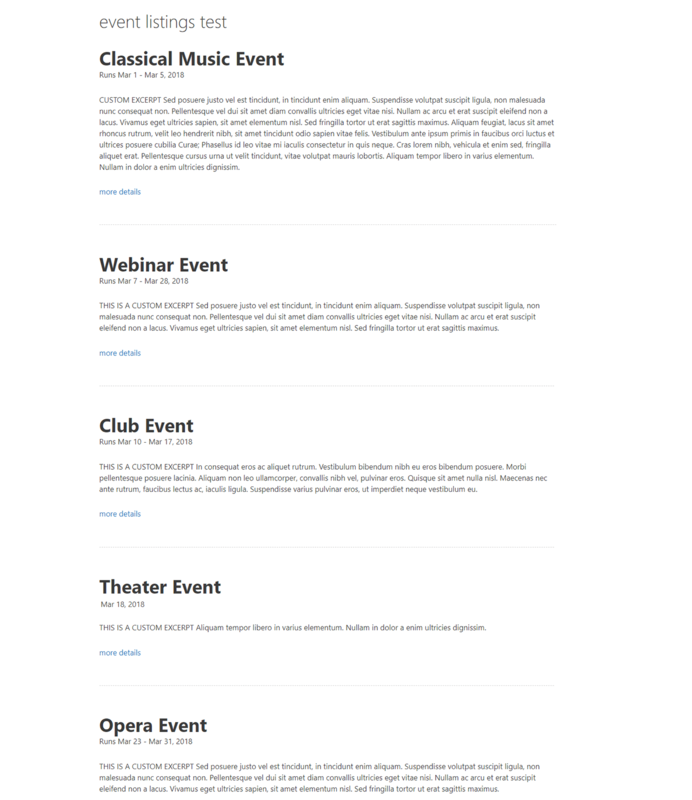 Event modules are a designed to display a small number of upcoming events in a three or four column layout. They contain critical what, when, where info along with ticket purchase and more details call to action buttons. 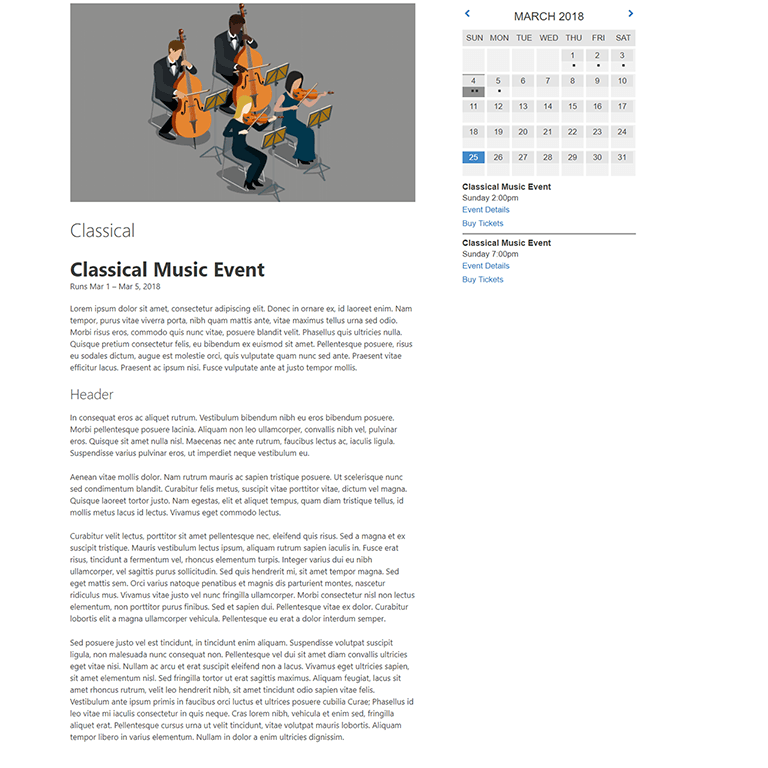 The three column layout option provides the ability to use free form text in the first column, followed by three columns with the next the upcoming event occurrences. Out of the box, the default calendar styles are designed to look great. 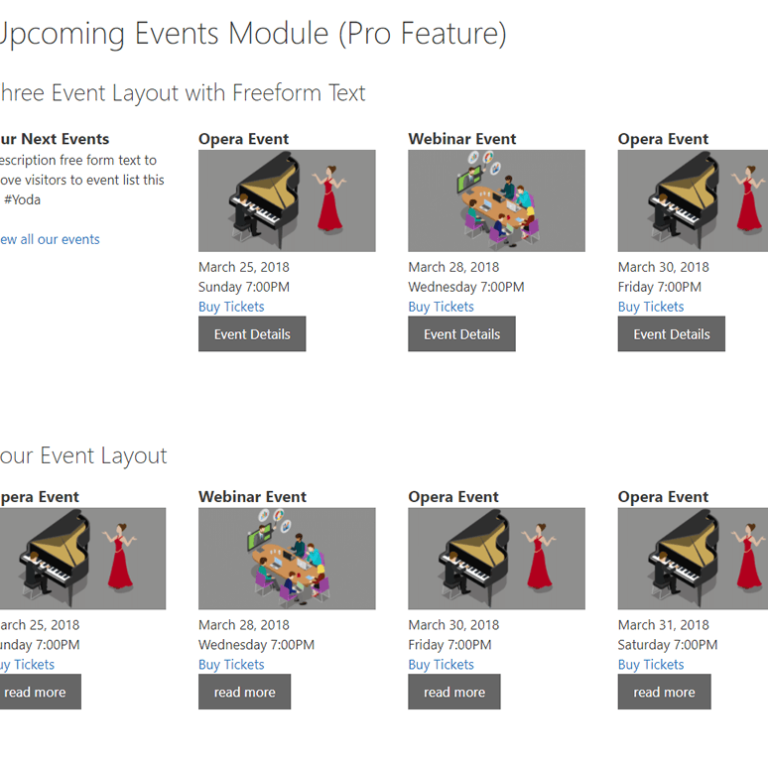 While the number of variations you can create are more than we can show here, these examples represent some of the most common layouts for single event pages, calendars, lists, and modules (Pro feature). Don’t miss the user showcase to see the full extent of you can accomplish! Calendar with key and category colors. Calendar with no category colors. Calendar in stacked view (mobile and sidebar). List with full width image, grouped occurrences, and minimal details. List with grouped occurrences and no more details link. List with grouped occurrences and excerpts. 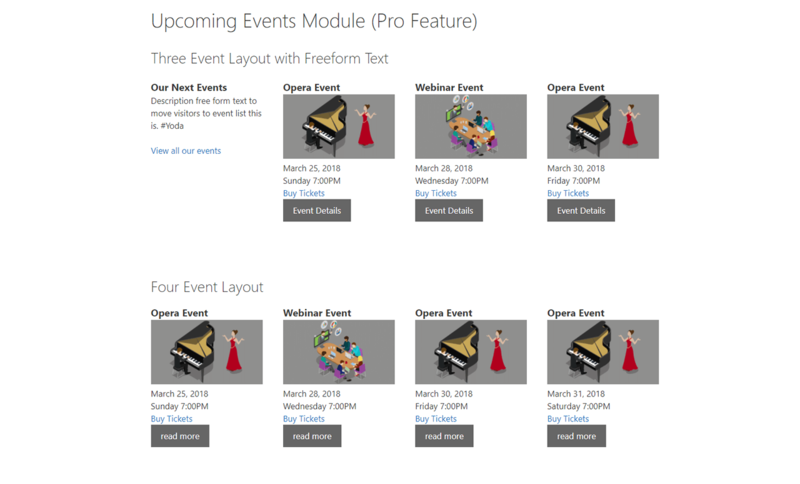 Event module in both three event and four event layouts (Pro feature). 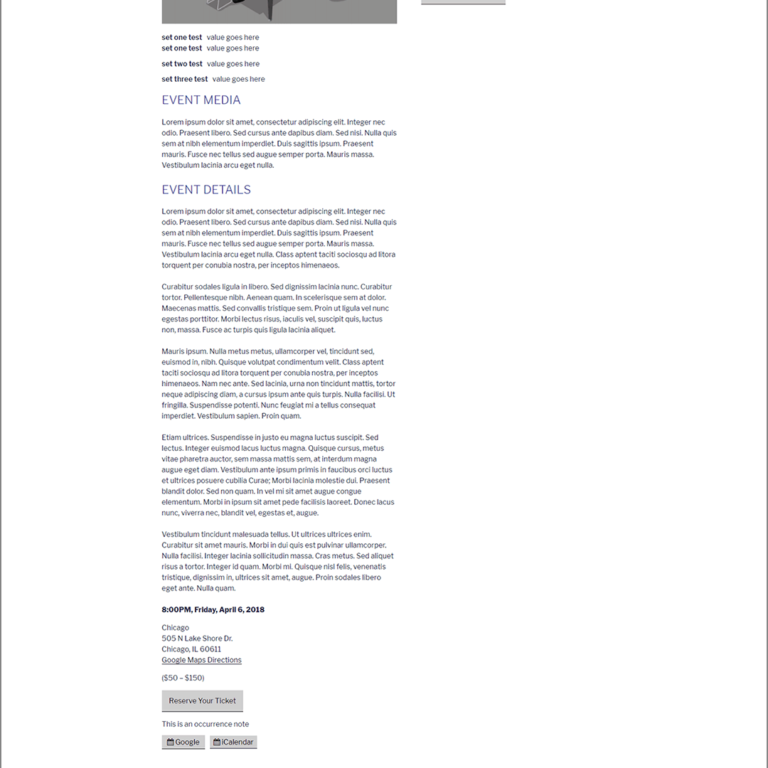 Single event page, no sidebar. 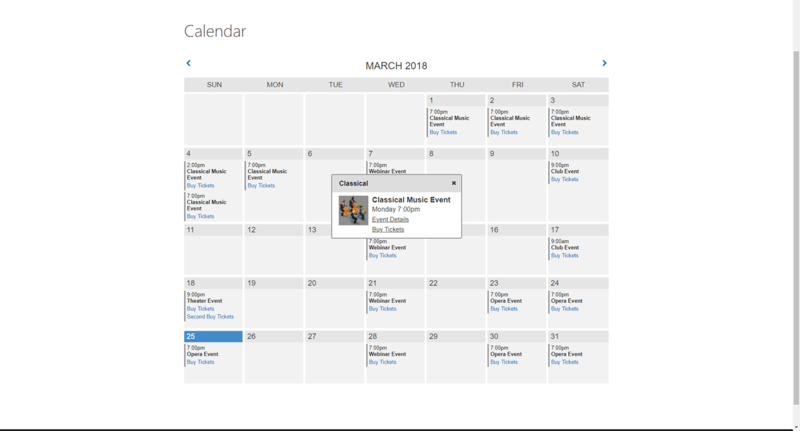 Single event page with panel calendar in sidebar for occurences. 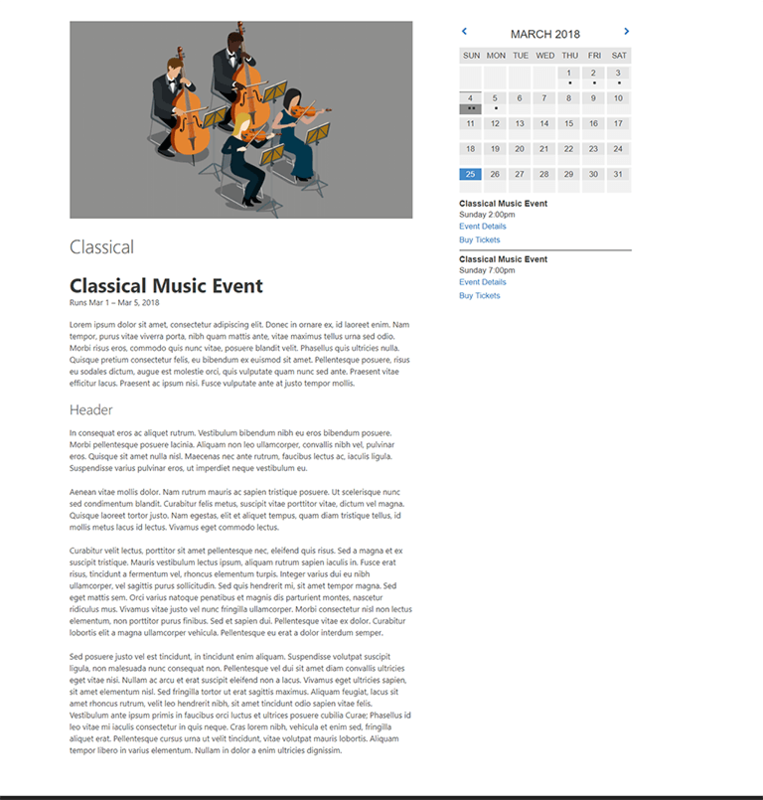 Single event page with What, Where, When event widget. 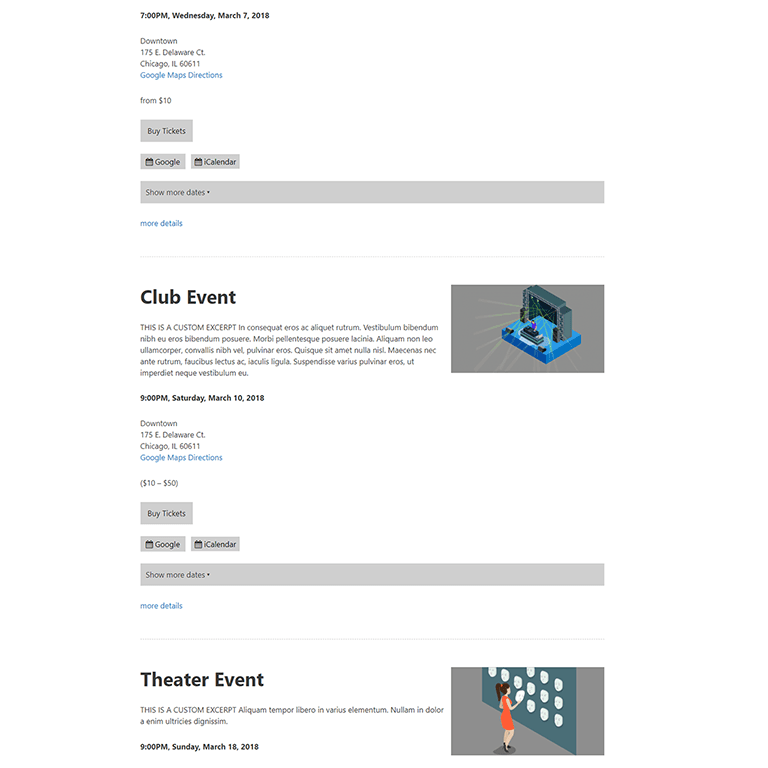 Single event page with What, Where, When event widget and event search and filter widget. 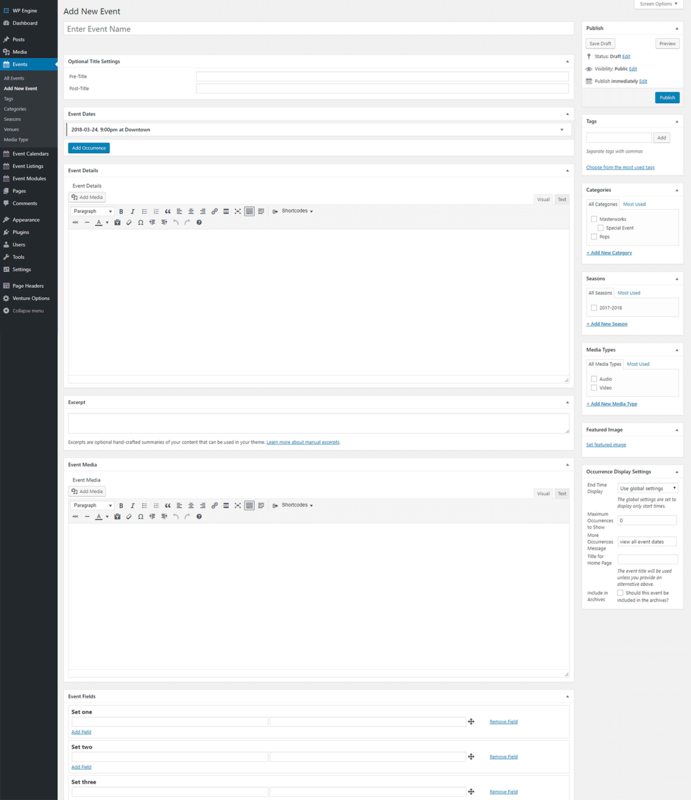 In the end, an event management plugin is only as good as it runs on the default WordPress theme. 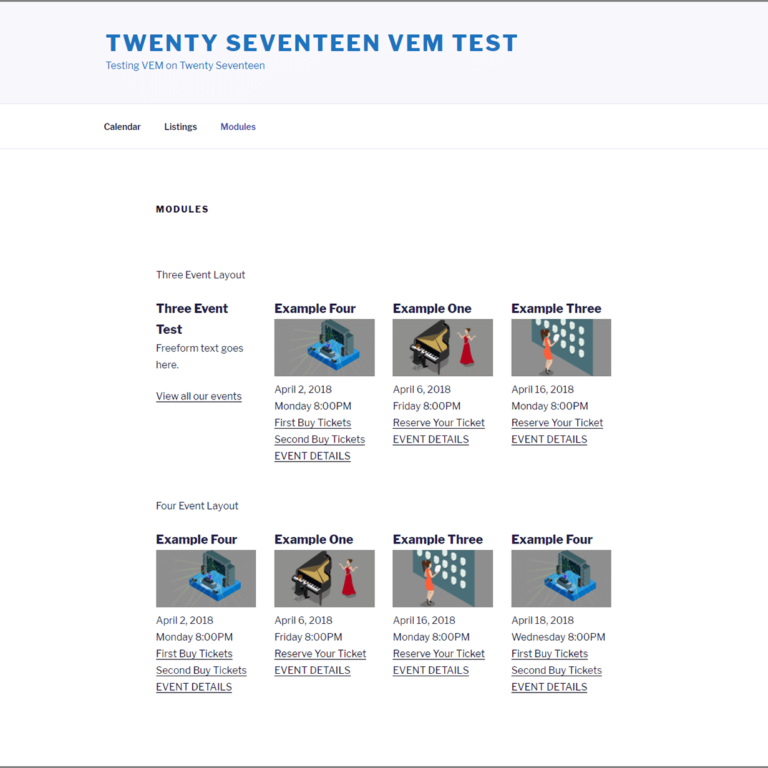 As such, we wanted to show you just how good Venture Event Manager looks running on a vanilla install of Twenty Seventeen. No tweaks, no sneaky CSS, just pure out of the box goodness.